Mehmet Ali Uludağ, a Turkish refugee in Germany who lost his wife to cerebral hemorrhage last week, said that his elder brother has been detained in a midnight raid back home. “My pain has been multiplied now. I have two brothers. One is Veli Uludağ who died as a martyr for Turkey in 1996. My other brother is Mutlu Uludağ. He has just been taken into custody. What could be the reason to take him into custody at this hour by raiding the house at 1 in the morning and to handcuff him behind back?” Mehmet Ali tweeted late Friday. Mehmet Ali wife Esma Uludağ, a 35-year-old woman who fled Turkey’s post-coup crackdown to Greece died in Athens on Apr 28. A mother of three children aged 3, 7 and 10, she was a civil servant in Turkey’s western province of Izmir until she was dismissed over alleged links to the Gülen movement. She followed her husband, Mehmet Ali to escape further persecution from the Turkish government, seeking asylum abroad. While Mehmet Ali had ended up in Germany, Esma and their three children barely managed to land in Greece, awaiting family reunification as part of Mehmet Ali’s refugee claim. 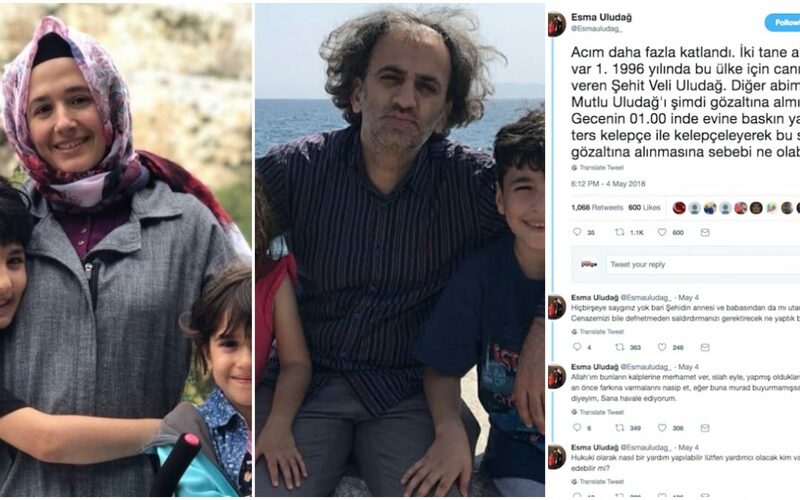 Esma’s body was transferred to Izmir for funeral while his three children have been granted permission by German government to stay with their father. Thousands of people have fled Turkey due to a massive witch-hunt launched by Turkish government against sympathizers of the Gülen movement. Turkish government blames the Gulenists fort he July 15, 2016 failed coup while the latter denies involvement. Many tried to escape Turkey by illegal means as the government had cancelled their passports like thousands of others. On Feb 13, 2018 at least three people died and five others were missing after a boat carrying a group of eight capsized in the Evros (Meriç) River while seeking to escape the post-coup crackdown in Turkey.